As spring rolls around in most parts of the country, here in Seattle, we usually have a few warm days and lots of rainy days intermixed. I don’t mind the rain for sleeping in, lounging and reading a book, sipping tea etc. For planting seeds, it is often too soggy. A few years ago I had a student who made me a grow light and stand in wood shop – awesome right? However, I have no idea where my precious light went. So this spring I have decided to try a new way of starting seeds inside. Egg Shells. 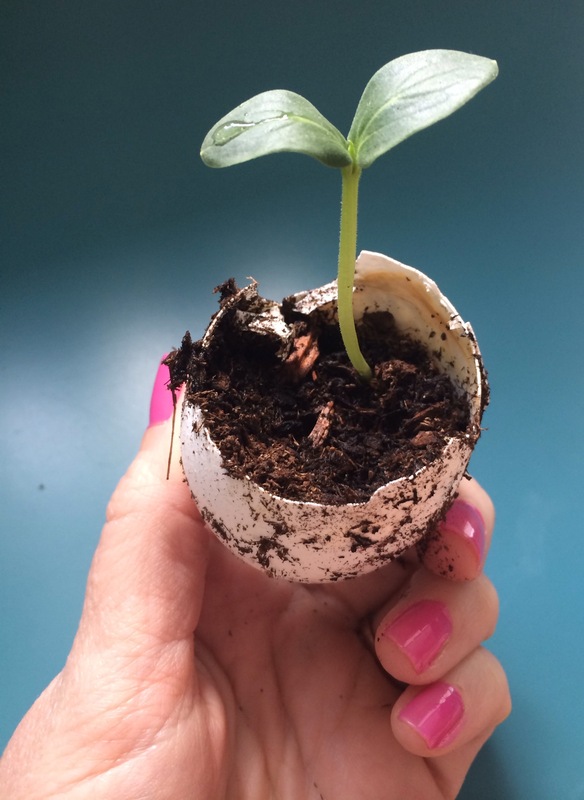 I had seen and read about people using egg-shells, and I wasn’t really sure how this would work, in the past I’ve used the little peat pots, or the starter discs that fill up with water. Last spring, I used those little discs and the batch I got was infested with bugs and once I started watering the plants the bugs hatched – super gross. I also really am not a fan of paying for things that have temporary uses – like those little dirt discs or peat pots. My thinking is that we eat a ton of eggs, probably should have chickens we eat so many eggs. Since I have an abundance of free egg shells I thought I would give it a try. Let me tell you, I am so glad I did. I was able to grow seeds in lightning speed. Within one week the seeds were doing amazing and some were even overachieving like the one on the left. 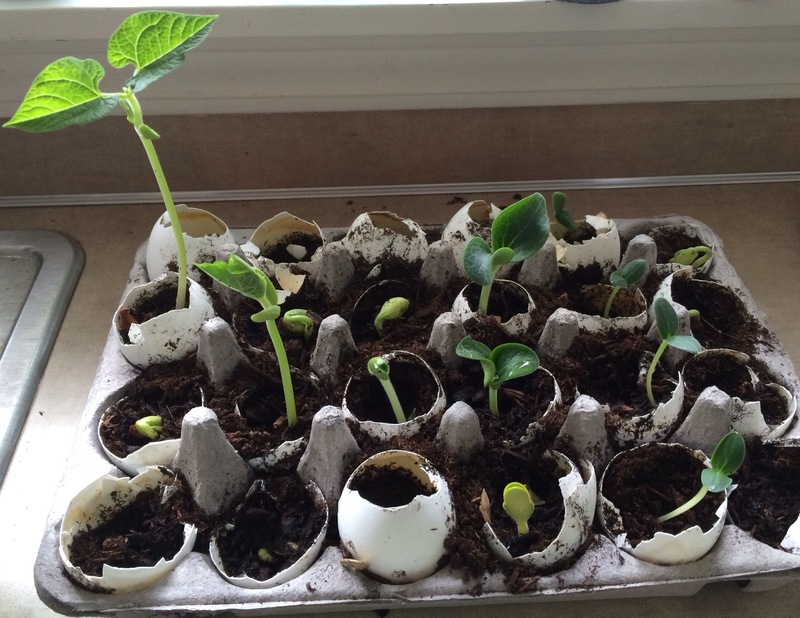 Okay let me tell you what we planted in our egg-shells. After two weeks some of the green bean seedlings were getting so big they needed a larger space, so I put a few of them into smaller pots. It is still in the low 40s at night, sometimes still frosting and I am planning to keep them inside just a little bit longer before the hardening off process will take place. 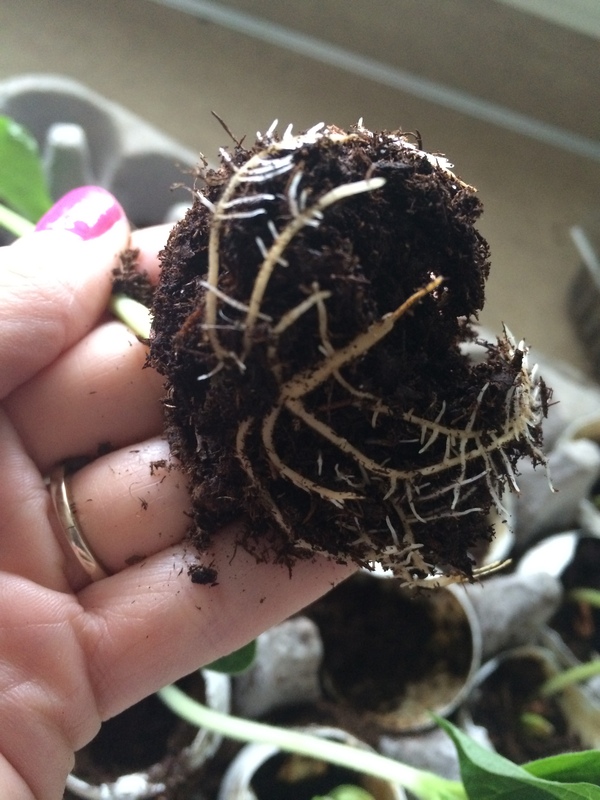 What I thought was so interesting about using the eggs is that the roots seem to be so much more extensive than I have seen in the past, I don’t know if it is the thin membrane on the eggs, but look at those roots. 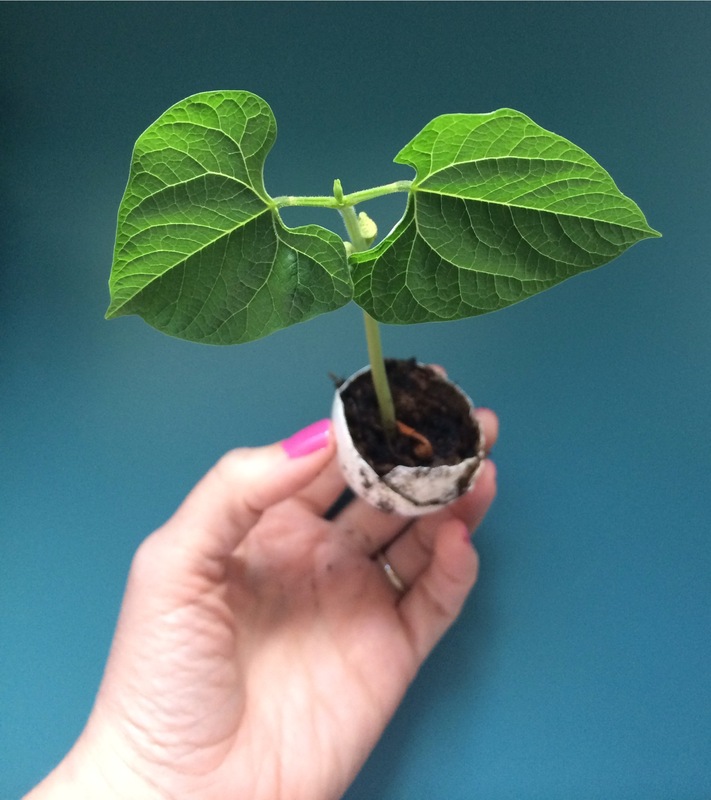 The petite and I had so much fun pealing the egg off of the new little plant and putting them into bigger pots. After already planting these little seeds I read that sometimes smaller seeds do better (oh well, mine did just great), so now I just need to make a frittata, quiche or something to get some more egg shells to start my next batch of seeds, as you may have seen me mention the petite wants to grow “salad” in the gutter garden, so we need to get seeds sown to make her gardening dreams come true. I loved doing this project and it is really so easy to do. The hardest part is remembering not to demolish the egg-shell when you crack it. A really great blog that I am loving to read about all things garden related is Gardening Betty, she has given me some amazing ideas on using found items at home and ways to shop the local dollar store for items that I don’t have around the house. I am most jealous of her amazing avocado tree, if only one would grow in Seattle.